6 years later, I finally got my new large screen LCD. Costs less, but much lager (17" vs 24"). 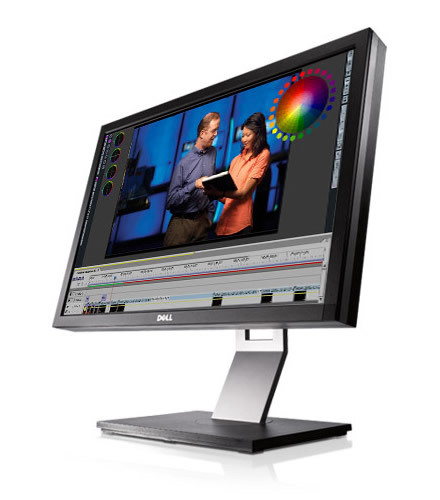 Dell U2410, what I like most, is the OSD design. 5 buttons with touch sensor and blue LED, when moving fingers over it, the LED turns on automatically. Touch it slightly, the other 4 button LED turn on and the menu appears just next to them. With so detailed settings, U2410 meets all my needs. I've been thinking of buying a new LCD from last Oct. When doing the coding and designing work, the old pal Maya 17" was not large enough to show so many windows I opened. And it was too dark to watch movies. After all, it's been worked for me for 6 years. 2408WFP was my target at that time. Just one thing: it exceeded my budget. Then I waited and waited. So many times, I would like to step back and get the 22" model, with was so hot and popular too, 2209WA. What a coincidence, 2 days before I making the decision, Hei told me a new model released. This is it. Another dream comes true story. There are 2 responses to “Welcome, Dell U2410!”.